The half-life of a link is hilariously brief, so here is an attempt to bring some new life back into the depleted viewership of our summer-time blogging. Keep in mind that you can search for any of the articles on our blog using the search tool, shown here, or sign up for email updates lower down on the side bar, for hands-free, automated Agile goodness every time we post something new. Well worth showing off, 4 July: This post was a demonstration of the presentation tool Prezi applied to pseudo-digital geoscience data. Geoscience is inherently visual and scale dependant, so we strive to work and communicate in a helicoptery way. 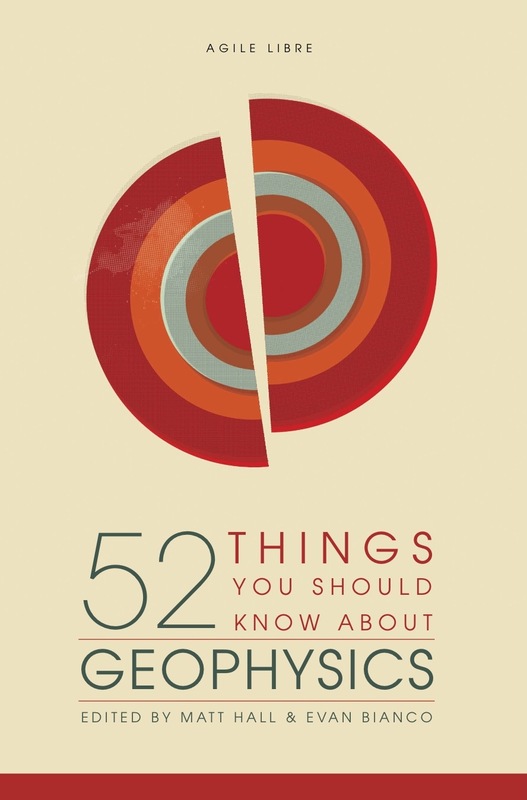 I used Prezi to navigate a poster presentation on sharing geo-knowledge beyond the experts. Geophysical stamps—Geophone, 15 July: Instalment 3 of Matt's vintage German postage stamps was a tribute to the geophone. This post prompted a few readers to interject with suggestions and technical corrections. We strive for an interactive, dynamic and malleable blog, and their comments certainly improved the post. It was a reminder to be ready to react when you realize someone is actually reading your stuff. 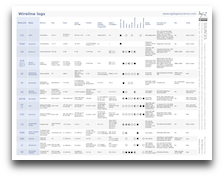 Petrophysics cheatsheet, 25 July and its companion post: Born out a desire to make a general quick reference for well logs, we published the Petrophysics cheatsheet, the fourth in our series of cheatsheets. In this companion post, you can read why petrophysics is hard. It sits in a middle ground between drilling operations, geoscience, and reservoir engineering, and ironically petrophysical measurements seldom measure the properties we are actually interested in. Wireline data is riddled with many service providers and tool options, data formats, as well as historical and exhaustive naming conventions. How to cheat at spot the difference, 3 Aug: Edward Tufte says, "to clarify, add detail". Get all your data into one view to assist your audience in making a comparison. In this two-part post Matt demonstrated the power of visual crossplotting using two examples: a satelite photo of a pyroclastic flow, and a subsurface horizon with seismic attributes overlain. Directly mapping partially varying properties is better than data abstractions (graphs, tables, numbers, etc). Richer images convey more information and he showed us how to cheat at spot the difference using simple image processing techniques. Digital rocks and accountability, 10 Aug: At the First International Workshop in Rock Physics, I blogged about two exciting talks on the first day of the conference on the promise of digital rock physics and how applied scientists should strive to be better in their work. Atul Gawande's ternary space of complexity could serve as tool for mapping out geoscience investigations. Try it out on your next problem and ask your teammates to expose the problem as they see it. Wherefore art thou, Expert?, 24 Aug: Stemming from a LinkedIn debate on the role of service companies in educating and empowering their customers, Matt reflected on the role of the bewildered generalist in today's upstream industry. Information systems have changed, perfection is a myth and domain expertise runs too deep. Generalists can stop worrying about not knowing enough, specialists can builder shallower and more accesible tools, and service companies can serve instead of sell. Pseudogeophysics, 31 Aug: Delusion, skeptisicm, and how to crack a nut. This post drew comments about copyright control and the cost of lost opportunity; make sure to read the comments section of this post. So yeah, now go catch up on your reading.